lot of warrior बिल्ली. . HD Wallpaper and background images in the Warriors (Novel Series) club tagged: bluestar and others. That is some fancy artwork! Cloudtail Looks as curious as he did when he was a kit! Brightheart's bad eye is feaking me out!! sorta gross. Ew. was yellowfang really that fat? 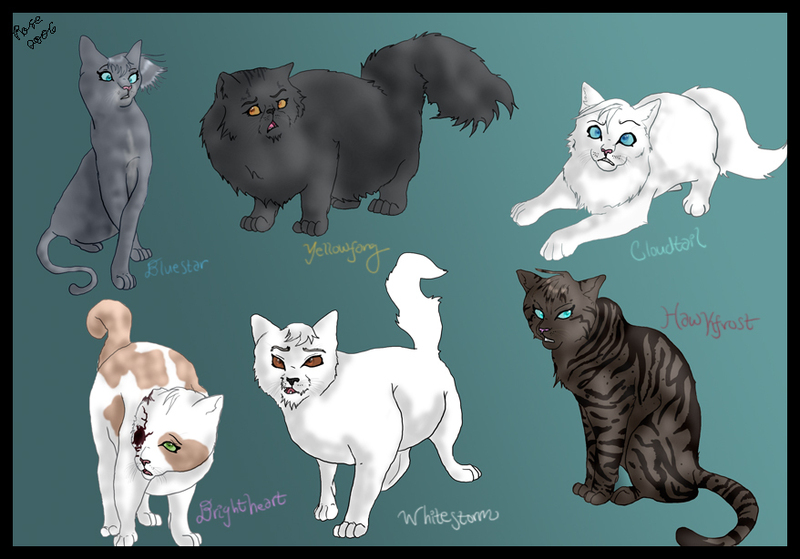 Bluestar looks so young....how did u drawl these to look so cool! @ WCNUTTER I GUESS IT'S KINDA HARD TO TELL , BUT IN THIS PHOTO YELLOWFANG ISN'T BLACK. SHE'S NAVY-BLUE. ANYWAYS I THINK ALL THOSE WARRIORS ROCK EXECPT I DON'T KNOW MUCH ABOUT WHITESTORM! Hawkfrost looks like he got fleas in a place he cant reach.... he looks like he also have a furball stuck somewhere.................................­...­...­...­...­...­...­...­...­...­...­...­...­. hawkfrost is scary! i dont think yellow fang is thAT colour or is that fluffy. also is lostface brightheart? Bluestar looks a bit weird. So does Whitestorm. But there are still really good! i have this pic of brightheart from cats of the clans. i bring it to school and i show my friends and they freak out!! Hawkfrost ROCKS!!! but yeah i thought yellowfang was Gray. wow brightheart eye is like wow! there no eye there! and cloudtail looks so cute just because he looks so curious! Cloudtail looks funny... Or is that Whightstorm with the funny face..... WHIGHTSTORM!!!!!!!!!! I can understand why BrightHeart likes CloudTail! But whats behind BlueStars ear? And HawkFrost? HECK NO! yellowfang-"What did you just say about my fur?" cloudtail-"Try wearing pants more often!!!" brightheart-"I'm a--" (yawn) "Little sleepy..." (yawn) "I'll just... I'll just lay down... lay down over here, how about?" everybody's quotes according to the pics!!! wooHoo! !